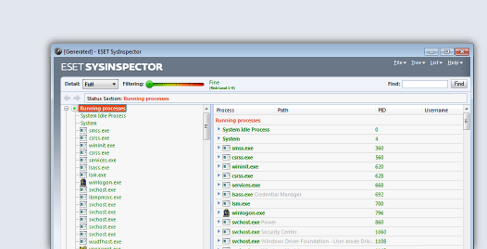 Use the ESET SysInspector utility to inspect your PC. Fix problems straight away, or submit a log to ESET Customer Care for resolution. ESET SysInspector is an easy to use diagnostic tool that helps troubleshoot a wide range of system issues. Coming either as a free, standalone application, as well as, integrated into actual versions of ESET NOD32 Antivirus and ESET Smart Security , it captures critical and detailed information about your computer.